He was an African who had a strong jaw and a bad back… So what was he doing in Ipswich in the year 1190? To me, as an anatomist and forensic anthropologist, he was a man in intractable pain – probably incontinent and most likely paralysed in both legs. To Caroline he was a man with a strong jaw-line and a face full of character. To Wolfram he was a set of intriguing chemical ratios that strongly suggested his North African birth origin. But to historian Jim, he was a revelation. Between the fall of the Roman Empire and the 16th Century there are few verifiable records of Africans in England, and here was a black man buried in a medieval Christian friary in Suffolk. This man was so very many things to different people and without the focus of an integrated team, you can miss what may turn out to be a pivotal moment of discovery. Along with two colleagues from Dundee University – facial reconstruction expert Dr Caroline Wilkinson and bone isotope analyst Dr Wolfram Meier-Augenstein – I had spent nearly five months recording a four-part television series for the BBC. We would start each case with an often rather uninspiring box of bones but by the end of our investigation we had uncovered a recognisable person, delved into their life and their death, and come face-to-face with how they would have looked. And with the expertise of historians and archaeologists, such as University of London medieval historian and migration expert Professor Jim Bolton, we could try to make some sense of the importance and relevance of our findings. 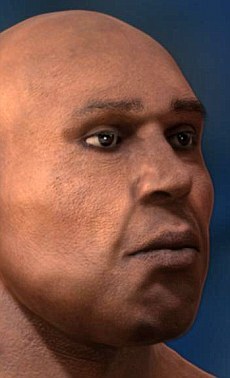 Our African man was excavated from the burial ground of a friary in Ipswich. This incontrovertible statement generates a significant number of questions: why was an African man in Ipswich in medieval times? What was he doing there? How did he get there? Where did he come from? Why was he buried in the cemetery of a friary? What did he look like? How did he die? But these are the same questions that would form the basis of a modern-day forensic investigation into an unidentified corpse. The difference was that this man had been dead for 800 years. The challenge here was to use our modern investigative practices and scientific techniques to see just how deep we could delve into this historical cold case. While the time period may pose its own challenges, the processes would be the same as if he had died only months ago. Looking at the chemical composition of the man’s bones and teeth using stable isotope analysis told us that he had been born in North Africa. This ‘chemical signature’ is formed from everything we ingest – what we drink and eat becomes part of us and shows up in parts of our body, such as bones and teeth. This man’s chemical signature showed the diet in his first years was typical of a North African environment at the time – a good balance of fish, meat and vegetables. Radiocarbon dating of the man’s thigh bone told us that he died between 1190 and 1300, and the anthropology of his skull told us he had African traits, but they were not sub-Saharan in origin but those of someone from North Africa. 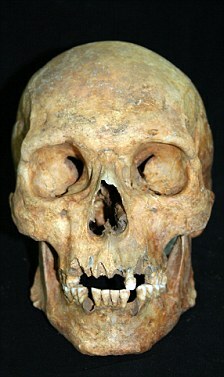 Independent of the stable isotope analysis and skull shape, the man’s DNA also located him as coming from North Africa. Small areas of the double helix in his DNA were consistent with an ethnic origin from that region of the world, or even further east towards the eastern border of the Mediterranean. To have these different areas of science all independently confirming the same region of the world for his place of origin is compelling evidence of hi s ancestry. However, it was a revelation for the historians – incontrovertible proof of African migration into England in the medieval times. While he wouldn’t have had the very dark skin of the sub-Saharan African, his skin colour would have been more like a modern Moroccan. He would certainly have stood out in 13th Century Britain, where virtually everyone else would have been light-skinned. The man’s bones also told us that he was not undernourished and ate a good, healthy, balanced diet. They told us he was a well-built, middle-aged man with strong muscles who was unlikely to have been a slave. Where muscles join bone they leave an imprint, and the stronger the muscle the bigger the imprint. But this man had a spinal abscess that was slowly building up pressure on his spinal cord. The first thing he would have noticed from this would have been the pain in his back and in his legs. Then there would have been the inconvenience and social unacceptance of loss of control of the bladder and possibly the bowel. Paralysis in his legs would follow, and ultimately his confinement to bed. We can also tell from the bones that he did not have a long illness – it was months rather than years – as there is no evidence of bone loss. And the abscess could have begun as nothing more than a simple infection for which these days we would take penicillin. The infection could have been caused by something as minor as a graze to the skin or an ingrowing hair in his lower back. In medieval England the only hope this man had for pain relief and medical care in his final days would have been from the religious establishments who tended the medicinal herb gardens and had some quite sophisticated and successful methods of easing pain. The friars would have taken him into their infirmary as his condition declined and he probably paid for his ministrations as they nursed him towards his death. For the man to be buried within the friary, he must have been a Christian. Had he converted religion? Coming from North Africa in medieval times, he would have been born a Muslim. Did this explain his migration from his homeland to Ipswich? Were we looking at migration following the Crusades? Unfortunately these are questions we can never realistically hope to answer to the level of courtroom certainty and we can only surmise, but the evidence is compelling. What we can deduce further about this man from the evidence is that he was probably a trader. Ipswich was a port and it is likely that, given his foreign birth, he was involved in the shipping of materials or minerals of some sort. The Crusades had sent Christian men from England to reclaim the Holy Land from Muslims, but one of the results of this was that more trade routes were opened up with the Muslim-dominated Eastern Mediterranean and North Africa. This man’s presence in Ipswich could well have been as a consequence of that. This man was not poor – a poor man would never have been buried in a single grave in an important part of the friary, as he was. The poor would have been buried in common graves. And it is most likely that he would have had to pay for his treatment at the friary. Sometimes wealthier people at the time would actually invest in a local friary in the knowledge that the friary would look after them when they fell ill and bury them when they died. These days we would go into a hospice for such treatment – in medieval times the equivalent was a friary. It offered an early form of palliative care. Forensic investigations progress under strict guidelines that fulfill the requirements of our judicial system. But working with archaeological remains gave us an unexpected freedom to explore avenues of investigation not normally addressed by our techniques and our expertise, and opened a window into a long-past era for which we were perhaps unprepared. The power of these four investigations is brought about by the interaction and support between two highly unlikely partners – forensic science and history. In a later programme in the series, we see science reveal secrets about a teenage Victorian prostitute from London which guides the historian to provide a possible name for the syphilis-ridden girl. A third programme reveals the gruesome history behind the mummified body of a small child and finally we reveal a possible identity for a knight buried in Stirling Castle. There is nothing more intriguing than the investigation of other people’s lives and this series shows that these stories can still be told even though they are buried deep within the bones of our ancestors. Using forensic investigative skills, we can interrogate those bones and cajole them into revealing their secrets if we know the right questions to ask. Not only can we surmise that someone was born in a certain area because of the chemical signature of their bones and teeth, but we can find out where that person has lived at other times in their life from similar methods, throwing light on past patterns of migration. For instance, nails and hair, where preserved, can reveal the place that a person has spent their most recent times. Cutting-edge science that can reveal details of our past and confirm or debunk theories and suspicions helps our understanding of both the world that is long gone and how it has shaped our lives today. It is fitting that our African man has raised his profile at a time when the issue of immigration has become a central topic of discussion for our modern society. History Cold Case is on Thursdays on BBC2 at 9pm.